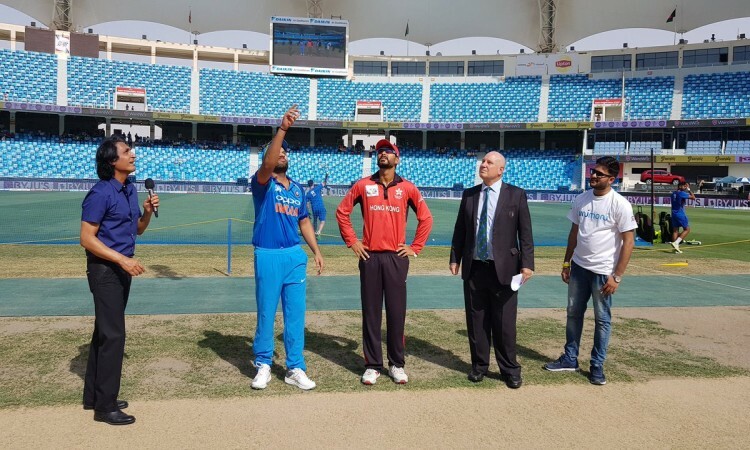 Dubai, Sep 18 (CNMSPORTS) - Hong Kong won the toss and elected to field against India in the group A match of the Asia Cup here on Tuesday. For India, young pacer Khaleel Ahmed is making his international debut. India: Rohit Sharma (captain), Shikhar Dhawan, Ambati Rayudu, Dinesh Karthik, M.S. Dhoni, Kedar Jadhav, Bhuvneshwar Kumar, Kuldeep Yadav, Shardul Thakur, Yuzvendra Chahal, Khaleel Ahmed. Hong Kong: Nizakat Khan, Anshuman Rath (captain), Babar Hayat, Christopher Carter, Kinchit Shah, Ehsan Khan, Aizaz Khan, Scott McKechnie(w), Tanwir Afzal, Ehsan Nawaz, Nadeem Ahmed.